The one you have to keep an eye on. Prisoners milling around in a mixed security yard. The lifeblood of your prison, prisoners are the criminals and scumbags you are tasked with containing and maintaining. Each prisoner has the same basic needs, a name, a personality, and a criminal record. Prisoners have many different hair-styles and skin-tones, as well as hidden traits which control how they will behave while in your prison. All prisoners in one prisoner are either male or female, there are no mixed prisons. Female prisoners sometimes have babies living with them in the facility. Prisoners have 3 initial risk categories, which give an estimate of the level of violence and disorder the player should expect from them based on their convictions. Risk categories do not directly decide how violent a prisoner will be, but internal character traits do. The player will have to observe prisoners and interpret their conviction records to better assess risk, changing their security rating if warranted. The ability to change the Risk Category is available on the prisoner's rap-sheet. Prisoners responsible for a serious injury will have their category automatically increased (min-sec to medium, medium to max-sec). Prisoners responsible for a murder will be charged and given an additional 25-year sentence, and will automatically reclassify as Maximum Security (if they weren't already). Risk categories Super Max and Protective Custody can only be assigned manually; they will neither arrive to your prison nor automatically set in case of some event. Risk category Death Row cannot be set manually; they will always have to arrive like this. The different categories can be identified by their color-coded uniforms (e.g. grey for min sec, red for max sec). Minimum Security $300 $150 These prisoners are the least risky and violent inmates to bring into a prison. Typically, these prisoners also have shorter sentences due to their lower level criminal charges, and therefore are due to be released more often. Medium Security $500 $150 Medium Security prisoners pose a moderate risk in accordance with their crimes. These prisoners may have longer sentences than Minimum Security prisoners, but are likely to be less violent than Maximum Security inmates. Maximum Security $1000 $150 Maximum Security prisoners pose the greatest security and violence risk of the available pool of transferable inmates. These prisoners are more likely to become angry when their needs are unfulfilled, may have more "Legendary" traits assigned to them than lower risk categories, and are also more likely to be Gang members. Super Max - $150 Prisoners of this category cannot be transferred into your Prison, and instead must be designated manually on an individual basis. A rating of Super Max indicates that this prisoner is extremely dangerous to the point that they should be treated differently from the general population, possibly even put in 24 hour lockdown. Protective Custody - $150 Prisoners of this category cannot be transferred into your Prison, and instead must be designated manually on an individual basis. This security level allows the player to segregate at-risk prisoners from the general population for their own protection. This is especially useful for protecting Snitches, Ex Law Enforcement, blown Informants, or even for breaking addictions through increased security. It can also be used to avoid Mass Assassinations if the according random Event happens, to isolate infected prisoners if the Virus event happens. Death Row $2500 $150 Prisoners of this category may only be transferred into your prison after unlocking this ability from the Bureaucracy menu. These inmates have an unlimited sentence time, instead having to go through an appeals process to attempt to commute their sentence before being executed by you. Death Row prisoners require specially designated cells and do not participate in Regime activities. Death Row inmates cannot be reassigned to any other category, however may be automatically reassigned to Maximum Security if their hearing is successful. In the Deployment menu, you can assign security sectors that will only allow prisoners of a certain category to enter them. In the Regime report, you can set up different regimes for the different risk categories which are present in your prison. In the Intake report, you can define how many prisoners of which categories you want to receive for your prison. In the Policy report, you can define how the security rating of a prisoner changes in case of certain incidents. For more information, see Need. 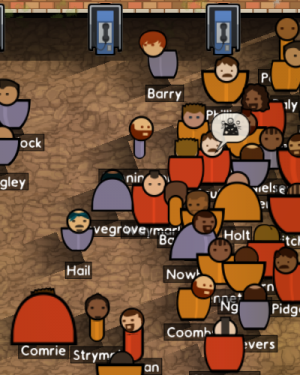 Satisfying basic prisoner needs is one of the most important activities in Prison Architect. If needs are met, prisoners are cooperative and are less likely to commit acts of violence or vandalism. If their needs are not met, they will begin to complain, vandalize, and fight. Angry Having being denied parole, more likely to start trouble. Bleeding Wounded in an accident, will continuously lose health. Calming Surrounded by a peaceful aura after visiting the Spiritual Guidance program, also affecting other prisoners around. Drunk Prisoner consumed booze (may lead to an addiction). High Prisoner consumed drugs (may lead to an addiction or an overdose). Overdosed Took too many drugs, must be treated by a doctor immediately. Overheating An status effect appears after Update-4 that affects with prisoners working in the kitchen. Sick Infected by a virus, might pass it to other prisoners; the virus might be deadly in extreme cases. Suppressed Suppressed prisoners are really unhappy (e.g. resulting in lower concentration during programs), but also less likely to misbehave. Surrendered Capitulated when being confronted with deadly force by Armed Guards. Tazed A guard shot him with a tazer, rendering him unable to move (though not injuring him). Well Fed All needs are fulfilled, especially the food need, but also including the ones not making prisoners angry otherwise. These prisoners are less likely to misbehave, and being well-fed contributes to the "Reform" grading. Withdrawal Prisoner is suffering from lack of an addictive substance. Every Prisoner has a list of hidden attributes assigned to them which the player may never clearly see; however, these traits will control whether the prisoner commits certain actions and how often they commit those actions. An example is Escape Tunnels being only dug by Prisoners possessing the "Clever" trait. As the crimes the prisoners have committed are also affected by their traits, the convictions in their biography give an indication about possible traits. Choosing The Lobbyist as a warden halves the chance of prisoners coming to your prison being violent or lethal. Misconduct can vary from destruction to murder. Low Security prisoners will be more patient in regards to their needs. High Security prisoners will often get angry quick if their needs aren't met. Misconduct is recorded on the prisoner's rap-sheet. For more information about the Lockdown Emergency Action, see Lockdown. Prisoners who commit any of the above misconducts will be locked down in their cells or solitary confinement, according to your prison's Policy. Once misconduct occurs, the prisoner will be placed in handcuffs and then escorted by a Guard to his cell, or to solitary confinement. Once escorted, the prisoner will receive a new status called "Lockdown" or "Solitary" that will begin counting down in hours and minutes. All of this can be changed in the Policy screen. In short, the policy can change the length of time a prisoner must stay in lockdown before being allowed out of their cell again, and whether the prisoner goes to solitary or his cell depending on the type of misconduct. You can assign discretionary punishments to prisoners via the rap sheet - up to 24 hours of Lockdown or 24 hours in Solitary. If researched by the Lawyer, even permanent punishment can be applied. Prisoners will then be locked in their cell or solitary cell until the player cancels this measure. Prisoners suppression rises while on Cell Lockdown (+1 every half an hour) or in Solitary (1+ every quarter hour). Suppression is reduced by 1 per hour after being released from lockdown/solitary. Prisoners in solitary confinement or locked-down in their own cells will have meals brought to them. This should prevent prisoners starving to death in solitary. The prisoner profile (also referred to as the 'rap sheet') is accessed by clicking the prisoner whose profile you wish to view and contains 4 tabs of information. Time served and time left in prison. List of convictions including whether or not the pleading for each conviction was guilty or not guilty. This sheet provides the ability to re-categorize the inmate's security level in the upper right-hand corner of the page. The player may also search the prisoner, his cell, or his entire cell block. Finally, individual punishments may be meted out, including the ability to set permanent punishments once unlocked through Bureaucracy. This is the only place to lock down a prisoner for an unlimited time (until cancellation). Some prisoners have a biography text defined by people who bought the "Name in the Game" package of Prison Architect. These biographies however don't affect the convictions. This tab will display any Reputation attributes the inmate may possess, but only if that attribute is known. Prisoners with a yellow "???" line in their description when hovered over possess a Reputation attribute which is not yet revealed, and therefore will not yet display in the Character tab. These traits make housing these inmates particularly challenging, as they possess abilities which make them either more dangerous to others, or a target for others. Tough / Extremely Tough - Can withstand a lot more punishment in a fight. He can also sometimes withstand being hit by a tazer. Snitch - A known informant, and as such his life may be in danger. Don't leave him alone with other prisoners for too long. Ex Law Enforcement / Ex Prison Guard - Was once a Police Officer, or some other law enforcement profession. His life may be in danger, especially if he used to be a prison guard. Cop Killer - Guilty of murdering a Police Officer. Your prison guards may be unable to restrain themselves when subduing him. Instigator - Sows seeds of discontent in all those nearby. When he causes trouble, nearby prisoners will feel compelled to do the same. Gang Member - Is an active member of a gang. He will defend his fellow gang members and will harbour hatred towards rival gangs. Preacher - This prisoner is extremely charismatic and is able to convert others to their religion, giving them the Spirituality need. In some cases, the prisoner will have a high degree of a reputation, e.g. "Extremely Strong" or "Extremely Volatile". In a very small number of cases, you will receive a Legendary Prisoner. These guys have a potent mix of the above list that makes them very dangerous. Legendary Prisoners will always arrive as Maximum Security or Death Row prisoners, and only they may be Gang leaders. The reputation of a prisoner may be known to you from when he arrives, or it may have to be learned through Confidential Informants or Phone Taps. Except for gang allegiances and the snitch reputation, the reputations of a prisoners will not change throughout the game. Choosing The Lobbyist as a warden halves the chance of prisoners coming to your prison being volatile, deadly or fighters. Choosing Rita as a warden halves the likelihood of them being stoical or fearless. Female prisoners generally are less tough and strong than male ones, meaning that their chances to win a fight against a (male) guard will be lower. The profile also includes an Experience tab showing which programs a prisoner has completed and what kind of activities the prisoner has been doing. A list of the most recent infractions committed by this prisoner, followed by their total time spent in your prison. This bar comparatively shows what your prisoner has been doing during their stay. Eventually, when the prisoner has been active in your prison for several days, the activity shown should normalize to reflect your Regime settings if the prisoner has been behaving. Apart from the regime activities, "Misconduct" and "Exercise" are possible options displayed here. The proportion of time your inmate has been either a Good, Bad, or Normal mood. This bar can serve as an indication of Need frequently going unfulfilled. If the inmate is currently enrolled in a Reform Program, the status of their progress will be displayed here. The top bar represents the time spent in the Program, while the bottom bar represents the prisoner's chance to pass the course. When the top bar is completely filled, the prisoner will either fail or pass the course. If the prisoner has attempted to pass Reform Program courses before, a list of them along with the inmate's pass/fail status will be provided. The final bar at the bottom of the sheet displays the inmate's sentence time. The total sentence time is shown on the far right, whereas the red bar represents time served. The lighter red and blue bars filling the bottom half of the bar represent when the prisoner will be eligible for Parole. If the prisoner's remaining sentence reaches 0, he will be released from your prison. The sentences use a time concept different from the usual game time. A one-year sentence equals 120 game hours (5 game days). Yay kids, that is at most only five more sleeps until Christmas! The last sheet shows a listing of the contributions to the Re-offending Chance of this prisoner, along with explanations for the numbers when hovered-over. Prisoner 'boiling point' factors in punishment/reform/health/security, so prisoners become less likely to misbehave over time, if you successfully punish/reform them, and take care of their health and security. Prisoners with long sentences ahead of them are more likely to cause. The gradings for all your released prisoners are combined together and shown in the "Prison Grading" view in the upper-left corner of the UI, next to the Bureaucracy button. This screen shows what type of prison you have produced, and how successful you have been. It's only available if at least 10 prisoners have been released. A representation of how much restriction was placed on the prisoner during their stay in your prison. Among other factors, how much time they spent in Lockdown plays a role in calculating this number. If the inmate participated and passed a Reform Program, then this rating is increased. A rating representing how controlled the inmates movements were, and whether security risks were present. Fights and escapes detract from this, armed lockdown counts towards it. 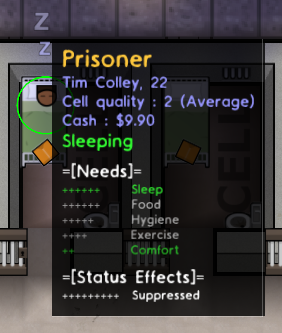 This rating defaults to 0 and moves negative with debilitating effects such as addictions and injury, while it moves right when the inmate is well fed, or exercises. This percentage represents the likelihood that when released, the prisoner will commit another crime. This score is affected by all of the above statistics (together with their age, number of prior convictions etc.) both positively and negatively (with addictions having a particular negative effect). Depending on your Policy settings, this number determines if the prisoner is able to be Paroled early. Despite the name, the number shown here is the actual re-offending chance as used by the game. E.g. a prisoner being released early due to Parole and has a displayed re-offending chance of 10 % will actually re-offend in 1 of 10 cases. Prisoners can fight other prisoners and guards. Prisoners can vandalize prison property. Prisoners will attempt to escape if there is an open path to the edge of the map. Prisoners will dig Escape Tunnels to create an open path to the end of the map if they have the 'Clever' trait. Simply using one fence will not stop them. Prisoners will have a decoy set in their bed while digging during night. Prisoner's dummies will still display the typical 'ZZZZ' to indicate they are sleeping. Possible to find during a shakedown at this time. Prisoners will steal, use and trade contraband. Prisoners will fulfil their needs if the rooms and equipment are available and if they are allowed into the appropriate areas that contain them. Prisoners will have their sentence count down at an accelerated rate (five game days being worth one year of sentence). When served; the prisoner's nameplate will flash RELEASED and they will exit the prison if there is a clear path. Prisoners can participate in reform programs. Prisoners can be in a gang. A prisoner committing a violent action such as attack, destroy items, escape etc. This page was last edited on 3 July 2018, at 20:03.